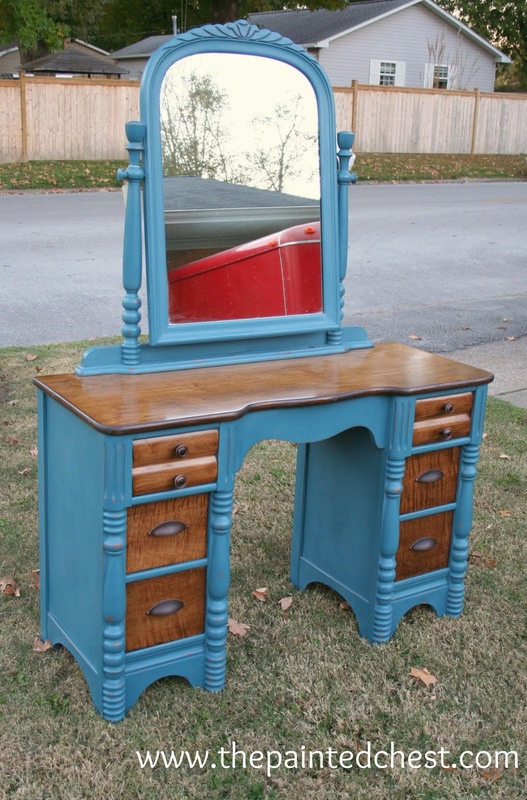 I picked up this vanity last summer. My husband was a little grumbly about it. I had recently hit an estate sale and we were pretty overloaded with furniture at that point. He did not want to bring home yet another piece. But it had good bones and was structurally sound. No repairs were needed. I had to have it! Yet, I had no thoughts or ideas as to how I would refinish it. The finish was VERY orange in color and I knew right away that it had to go. I sat on this piece for a long time waiting for inspiration to hit me. One day I just randomly grabbed a can of paint from the shelf and started painting. 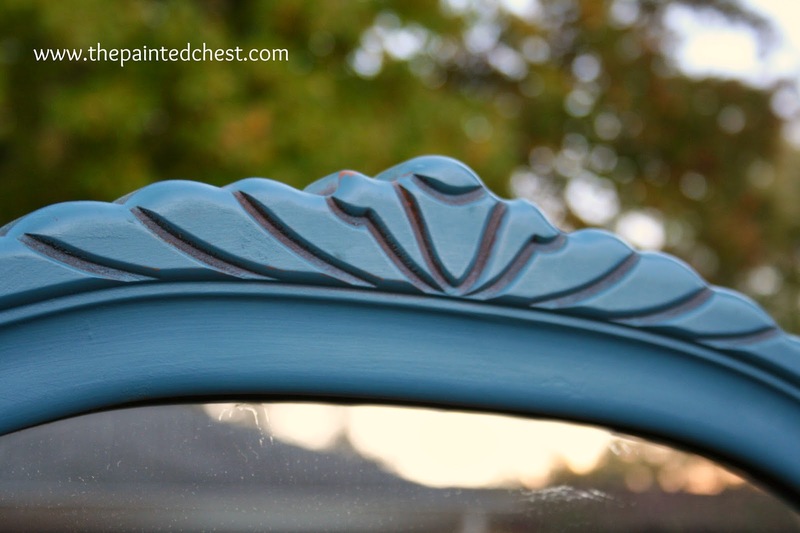 The color I chose was Annie Sloan's Aubusson Blue. I liked this color, but I had never used it on anything before. As I began to paint, I decided that I wanted to see wood against the Aubusson Blue. I stained the drawers and the vanity top in Minwax Dark Walnut. Dark Walnut is one of my favorite stains and I use it quite often. This piece is lightly distressed and finished in clear wax. 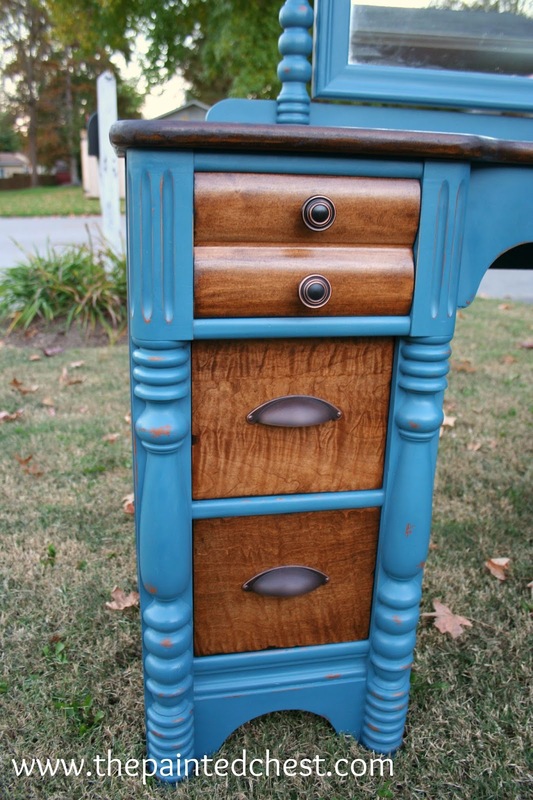 I replaced the large wooden drawer pulls with distressed bronze knobs and pulls. I have to say, I am thrilled with the results. I love all of the little details and character in this piece. It has become one of my favorite pieces. So without further ado, here is the final result! 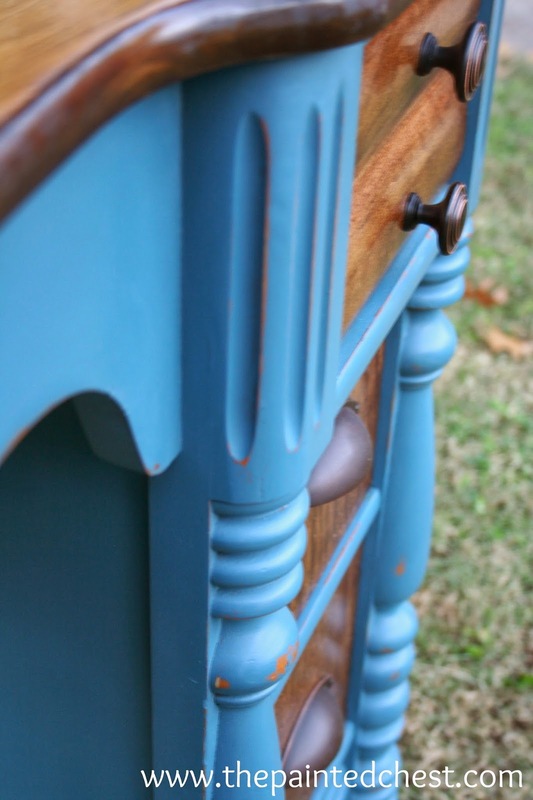 Are you a fan of two-toned furniture or would you rather see the piece completely painted? 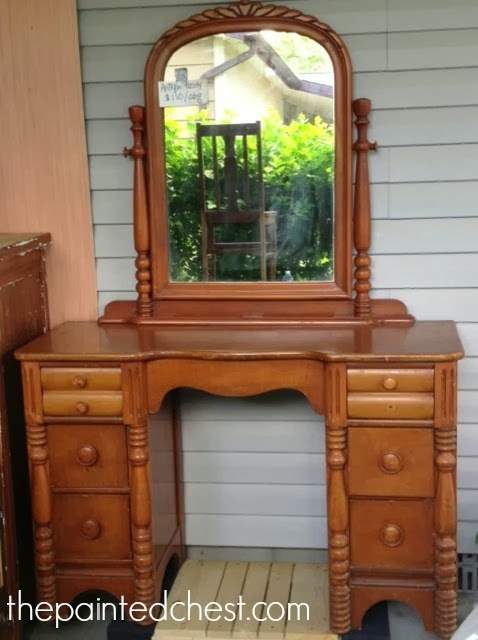 The vanity looks great!! I love the color and wood combination. Love it! Love this! Its beautiful, lovely work! Thank you, Anne! 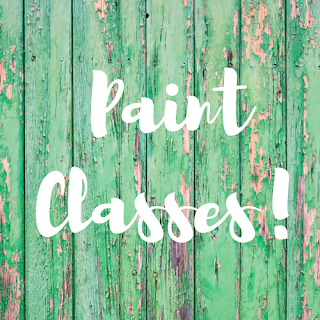 I just browsed through your blog and you do beautiful work! You aren't too far from me, I'll have to make a trip up to STL one of these days to go shopping! This is a stunning piece. I get the same grumbling from my husband when I want to bring home another project. I can totally understand though because I don't finish them very quickly and now our garage is packed. But how can you pass up something with such great potential. Great job! Thanks for sharing.